Rather than applying to a single taxonomic group, the word puffball covers a broad range of distinct species of ball-shaped fungi that are typically commonly spotted around the fields and forests of the United Kingdom from Summer through to late Autumn. If you look at the first part of the Latin name describing the genus of the various different types lumped together under the puffball handle, it becomes clear they are less closely related genetically than their similar appearances suggest. For example, there are the Common Puffball (Lycoperdon perlatum),Meadow Puffball (Vascellum pratense), the Brown Puffball (Bovista nigrescena), the Mosaic Puffball (Handkea utriformis) and the Giant Puffball (Calvatia gigantea). The most obvious distinguishing features between them are their sizes. The Common Puffball and Meadow Puffball, for example, grow only up to around 3-5cm in diameter, whereas the Giant Puffball has been known to get up to a meter. There are also their skins, or peridium. 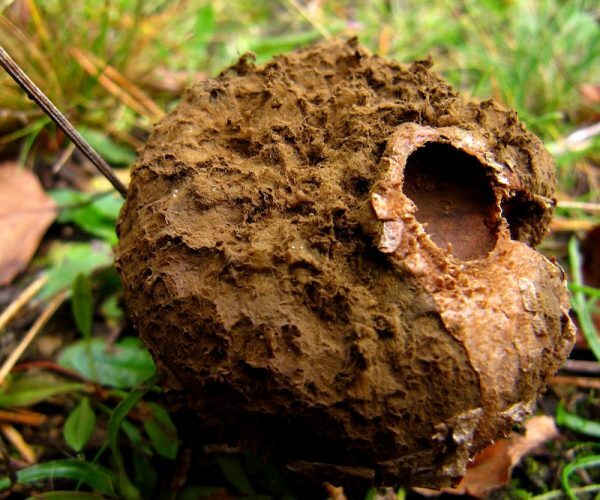 Meadow Puffballs have a rough, scurfy surface, while the outer layer of the Mosaic Puffball is made up of what appear as small, granular, polygonal plates. There’s even one whose surface of undulating ridges and crevices have led to its name of Calvatia craniiformis, or the Brain Fungus. If you can imagine the shock of stumbling upon one of these by accident, there’s a funny story from back in 2002 when a young couple walking through Epping Forest did just this, and believed they had come upon a murder site [link: http://www.terrain.net.nz/friends-of-te-henui-group/fungi-te-henui/brain-fungi.html]! 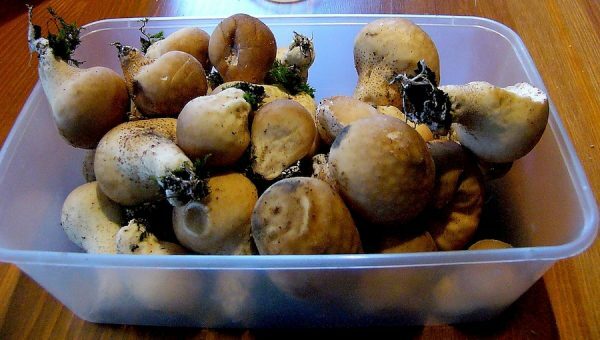 Brown and Giant puffballs, meanwhile, possess a smooth white outer skin, at least in their early stages. As they mature, the former turns a very dark brown-black, the latter turns yellow to ochre, the peridium becoming thick and leathery as the spores form inside. And indeed it is this that is the defining feature of all of the wider category of gasteroid fungi to which puffballs belong, along with other non-related classes such as stinkhorns, earthstars and the astonishing Devil’s Fingers (Clathrus archeri), which resembles a monstrous claw wrenching itself from the bowels of the earth. Gasteroidis of the same derivation as “gastric”, referring to the stomach, and describes the fact that the fungi in question produce spores inside their fruit bodies, or basidiocarps, rather than on an outer surface (on the underside of a cap like the gilled mushrooms do, for example). The interior of the fruit body, called the gleba, is initially solid and white. As the fruit begins to “ripen” and the spore mass grows inside, the gleba transforms in colour and texture, turning towards a yellow, ochre, muddy green or other colour depending on the species in question. Roger Phillips in his encyclopaedic Mushrooms and Other Fungi of Great Britain and Europe(first published in 1981), for example, describes the insides of the Brown Puffball as turning “dark purple-brown”, and the Giant Puffball becoming “olivaceous-brown and powdery at maturity.” The fruit bodies for most species also subsequently dry out and become very light, like polystyrene, before the peridiumruptures and the spores are released. Catch any of these aforementioned grassland species young enough, while the insides are still firm and completely white, and they make for fine omelette material once you’ve peeled off the outer skin, although once again, I shall reiterate the warning that you must be 100% sure of what you have picked before you stand thinking of eating it. 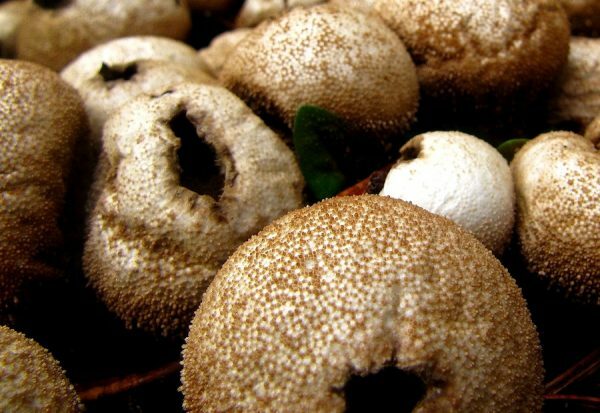 Read on, as not all puffballs are edible... Moreover, once the gleba begins to turn in colour as the spore mass starts forming, these gasteroids can cause pretty severe gastric issues. 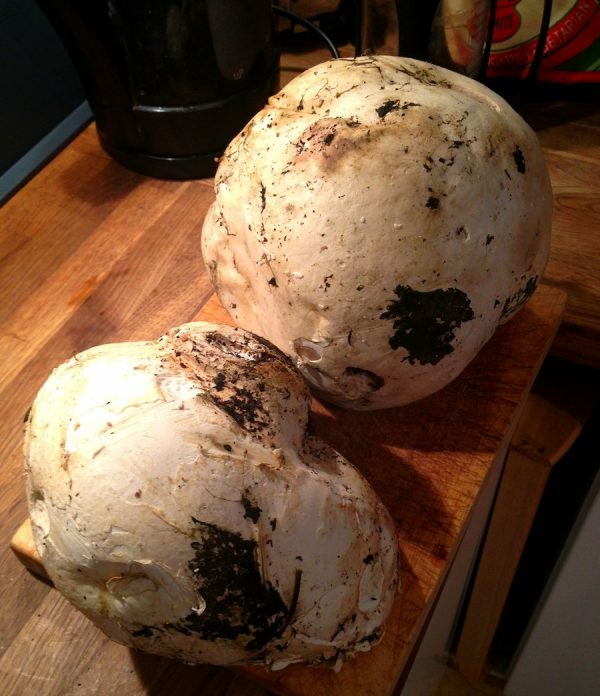 The best thing is to cut the puffball through vertically and check it is completely white throughout. H.G Wells check-listed the Giant Puffball in his 1904 novel The Food of the Gods, in which a group of scientists create a food source that rapidly accelerates the growth of all who consume it: “He spoke to several people about them, and said they were ‘marvellous!’ and he related to at least seven different persons the well-known story of the flagstone that was lifted from the cellar floor by the growth of the fungi underneath. He looked up his Sowerby to see if it was Lycoperdon coelatum or giganteum.” The passage refers to the 19thcentury mycologist James Sowerby, and lists the vast spherical fungi under its earlier Latin name of Lycoperdon gigantea. Elsewhere the Giant Puffball is also referred to as Langermannia gigantea, going to show that even within the world of expert mycologists, debates continue to rage over issues of precise classification that need not concern the amateur with a frying pan. Evidently most areas don’t possess these favourable conditions for spore germination. It might be my imagination, it might be that that I live in another part of the country to where I grew up, or it might be due to changing environmental factors, but the various grassland puffball species seem to be a lot less common than I remember them as being back in the 70s and 80s. In the woods however, there are a number that are much more frequently found. 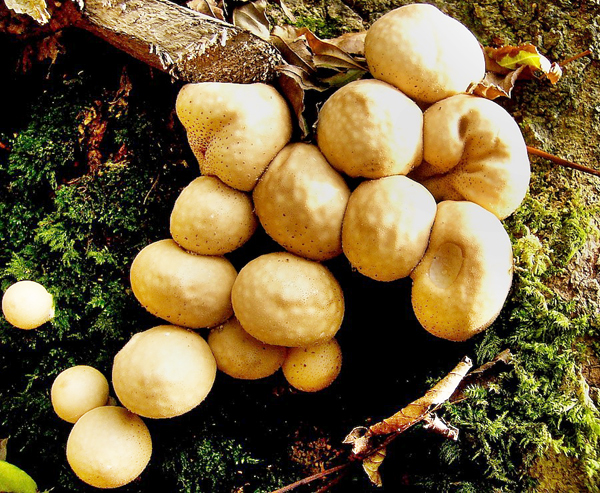 The Lycoperdon genus consists of about 50 species, many of which look pretty similar. The Common Puffball (Lycoperdon perlatum) provides a good template for identifying the others because it is so widespread in temperate areas, in deciduous and coniferous woodland, by roadsides or in parks and gardens. They grow from ground in a lightbulb-like shape, up to 5cm high and 3cm in diameter. The inner flesh of the gleba is pure white when young, as in all species, before turning yellow through to green-brown, while the exterior also goes brown or grey with age. When fully mature, a hole opens in the top of their skin (referred to as an ostiole in some sources and as an operculum or ‘apical pore’ in others), through which its millions of brown spores are dispersed, and then the now-dry remaining outer husk of the peridium begins to rot back into the ground. It is the peridium of the Common Puffball that provides this species’ main identifying feature, which is a surface covered in tiny conical spines. This gives rise to its other common names, the Warted Puffball or the Gem-Studded puffball. 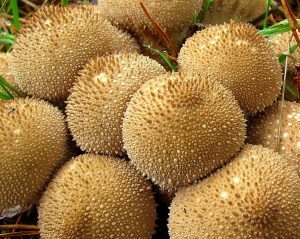 The Spiny Puffball (Lycoperdon echinatum) meanwhile, sometimes referred to as the Hedgehog Puffball, is about the same shape and size, but markedly different in appearance due to its longer spines, which can reach up to 5mm in length. 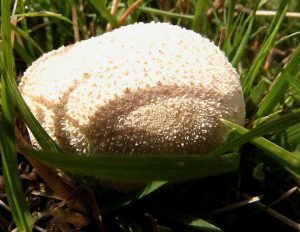 The Stump Puffball (Lycoperdon pyriforme) is another common find, and looks superficially similar to the Common Puffball, although the surface is smoother and the warty spines are much finer. The second part of its Latin name means ‘pear-shaped’ and draws attention to a fruit body that is slightly different in form, as Edmund Garnweidner in Mushrooms and Toadstools of Britain & Europe (2008) describe it, “with spherical top gradually merging with stem; often without distinct stem.” The other distinguishing feature is that these tend to grow in clumps, and on rotten wood rather than from the ground. Now again, technically this is edible. 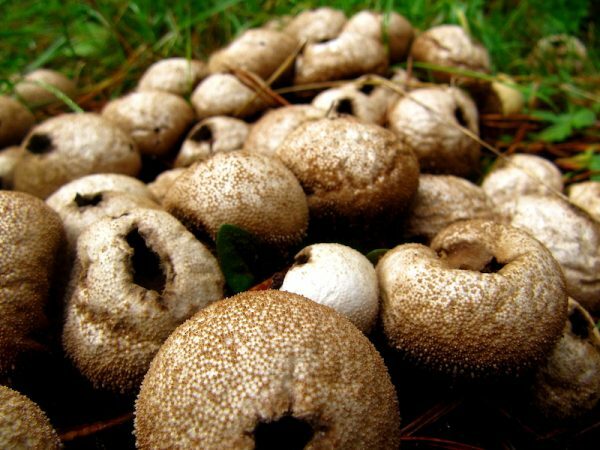 Garnweidner states under his entry for the Common Puffball, “All puffballs with pure white gleba are edible when young”, before contradicting himself by listing the Spiny Puffball as inedible. The rare Flaky Puffball (Lycoperdon mammiforme), identified by its thin white veil when it first emerges from its substrate that soon breaks up to leave a flaky surface, is also considered inedible, possibly poisonous. 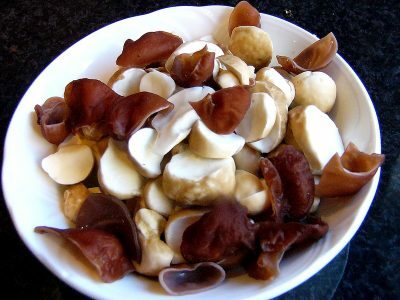 I have personally consumed Stump Puffballs, fried up with Jelly Ears as in the photo, and I enjoyed their distinctive aroma, although a friend of mine had them on a separate occasion and described them as the most revolting wild fungi he had ever tasted. One thing with these edible Lycoperdon species however is that when very small, they look pretty similar to young gilled species like Panther Caps (Amanita pantherina) before they have opened up, and this is most certainly not a mistake you want to be making. A few final notes on the puffballs. Firstly, there is a slime mould, Enteridium lycoperdon, that looks similar enough to be called the False Puffball, although as emphasized in a previous post, fungi and slime moulds (or myxomycetes) are completely different things. That said, Steven L. Stephensonin his Myxomycetes: A Handbook of Slime Molds (1994) does mention an indigenous tribe in Mexico’s Veracruz state that considers this a delicacy, which they refer to as caca de luna, a name which basically translates as ‘moon poo’. Continuing with the childish toilet humour, Lycoperdon is itself the Latin for ‘wolf fart’. It is not entirely clear where this name derives from, but it seems that the word ‘puffball’ might also have a more complex etymology than merely concatenating the two component parts describing its manner of spore dispersal and its shape. R.T. and F.W. Rolfe’s The Romance of the Fungus World(1925) claim that the name is instead “a corruption of puck or poukball, formerly called puckfist. The word puck is of Celtic origin, appearing in slightly varying forms as the Irish puca, the Welsh pwca or pwci, the Icelandic and Swedish puke and the Scottish puck, all denoting an elf, hobgoblin or demon.” They mention that this original word puckfist appears in The Lancashire Witches, but it is not clear whether they are talking about the original account of the Lancashire witch trials transcribed by Thomas Potts and published as The Wonderfull Discoverie of Witches in the Countie of Lancaster in 1613, or William Harrison Ainsworth’s 1848 novel based on the original case published as The Lancashire Witches: A Romance of Pendle Forest.